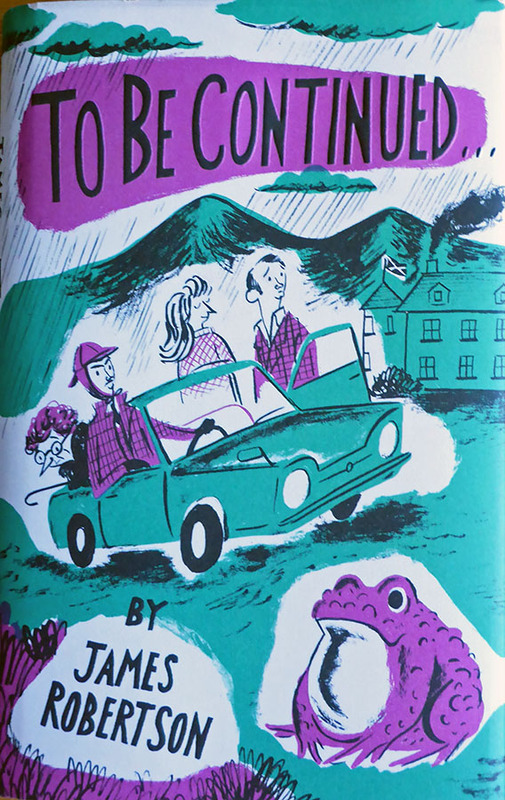 Book Review: To Be Continued by James Robertson #Scotland #Toad #Odd – The Diesel-Electric Elephant Company. …and yes, a hashtag of “Odd” is a bit rich, coming from me. Tis necessary though. As far as I was concerned, possibly in a semi-reliable role as buyer and reader, this was a roller-coaster of a book. I don’t refer to the plot, but to the fabric of the product itself. Cover and fly-leaf description had me heading towards the sky in my little seat-on-wheels, the opening chapter had me plumeting earthwards, the book as a whole kept me right up there, the feeling after reading the book was one of being right back on the ground again and wondering what I’d just spent some of my time reading. Recommended? Yes indeed, Hutson rarely forks out real moolah for a book without being very, very careful about it. So what dae ah meane aboot the wee rollah-coashter? Well, if you’re a nut-job such as myself, the cover is going to send impulses directly to any one of your three free hands to get on wiv it and lift the book off the shelf. The fly-leaf reading makes it certain that anyone with a bolt through his neck would then be trundling towards the checkout, fumbling in his purse for coin of the realm. Set in Scotland, which, for those of you unfamiliar with the planet, is a wholly foreign country but one that is fortunate to occupy part of England’s island archy-pelargoh, and is therefore one of the “other” “not English” countries of the world that I dislike least. For one thing, it’s not Los Bloody Angeles or some such similar, and for that it is immediately awarded a Big Gold Star for geography. The main protagonist is a chap in his fifties – halle-ruddy-lujah. Not some wussy hipster still in mental and emotional nappies, not some twenty-something or thirty-something-else “trying to make it in the city but distracted by the tragedies of cold lattés and ticking biological clocks”, and for that too it is immediately awarded a Big Gold Star for characterisation. Talking toad? Tick, VG – Big Gold Star for bufonidae insanity quite becoming. The opening though had me struggling, I found that it needed Percy Verance. In those early pages I almost set the book aside and chose something else to go with my stove-side chai and toast. I didn’t so much find myself being pulled into the story as I felt I were being assessed for entry, possibly by one of those huge, Neanderthal bouncers one finds controlling the doors on Grimsby fish & chip shops. That feeling lasted about a chapter and a half, after which the nagging disappeared and was replaced by compulsion. The “must find out what happens to this toad compulsion”. If you pulled apart the action in this book and set it out as a diagram on a blackboard there probably wouldn’t be a need to roll the board up for a second or third continuation. There is plenty of action for this book though. It’s just that if you are looking for action that leads you around in circles and ends somewhere significant, this is not the book for you. This book sort of meanders, pleasantly, but aimlessly. The compulsion to read continues right to the end – after which end I sort of fell off the tracks, plummeted a hundred feet or so and hit the pavement with that “what have I just read?” feeling puddled around me like gristle-juice and gore. To Be Continued is entertaining, well-written and different – but I had no idea what it was really about, if anything at all – and I should make it quite plain that there is no need for it to have been about something or anything at all, it’s just that one wonders. Scotland was neither rammed down my optic nerves nor was it explored in any great detail, it seemed almost incidental. I couldn’t find any moral hidden in the story, not that the story needed one. I don’t think that I am a better person for having read the novel, …but I am certainly a better-entertained one. I was happy to have read this wee beastie, but was left with the impression that I was missing everything. Perhaps I need to know more about Scottish history and characters, perhaps toads are central to the clans, perhaps Glentaragar House is real? I wish that I could put even a smidgen of that compulsion to read into my own work, but I don’t think that I have, yet, ever. That compulsion was a very clever thing to have achieved. Go buy this beastie and, once you’ve read it, let me know if I should have been more than entertained. Is there anything that I ought to have learned that I didn’t? Yes, yes, I know that ribbet is frog-speak, but aside from air hellair what do toads generally say? Bufo bufo?